Hello folks. Now, I realize that in my previous offering I promised a post regarding all things theatrical to follow soon and here we are nearly two and half months later. So sorry about that folks, but things have been rather hectic of late… I will try to keep it concise. Those of you who have been following my updates on Twitter will be well aware of all the day to day action. Incidentally, although the Duke himself has been tweeting (and how much do I despise using that word?!) for quite some time now, you can now follow Paul Pilot and Ben Castle to keep up with all the backstage news and shenanigans. Anyway, back to the beginning. We started rehearsing this monster of a play back in mid-August, both at rehearsal studios and at the National. It wasn’t until quite late in the process that we were actually able to rehearse the music with the actors. Tony Kushner’s recent translation of the play had been put on once previously in New York with Meryl Streep as Mother Courage with the songs scored by Jeanine Tesori. Peter was asked to write a brand new score for this production after he met Fiona Shaw at an awards ceremony in Los Angeles. During the rehearsal process the songs went through so many variations, cuts and key-changes as director Deborah Warner’s staging came into play. The Olivier Theatre (the largest of the three performance spaces at the National) is a vast space and the band were to be split between the stage itself and the two ‘ashtrays’ either side of the stage (two large raised podiums where we stationed ourselves permanently with percussion, keyboards and my main bass). It wasn’t until we joined the actors in one of the National’s huge rehearsal rooms that it became clear who could be on stage during each song and who would be positioned off stage in the ashtrays. Hence further re-orchestration! It was a fascinating process to go through and this continued right through into the technical rehearsals and even during the previews. It was the long period of previews and tech rehearsal that proved the most arduous. We would arrive at the theatre in the morning for a full day of rehearsing onstage; refining the flow of the play and the scene changes, and then go on to perform the whole thing in preview each night. We spent the lion’s share of the tech rehearsal traipsing back and forth inside an enormous tent for scene two, which proved to be one of the more ambitious scene changes. At one point the entire band was meant to surreptitiously emerge on a lift inside the tent once it was in place and we must have spent at least two entire days going up and down and back and forth before it was decided that this was entirely impractical… Ah, how I will miss that tent! The play had it’s official opening at the end of September after the previews were extended. Once we were up and running, Peter started a series of free gigs in the foyer every Friday and Saturday night after the performance. 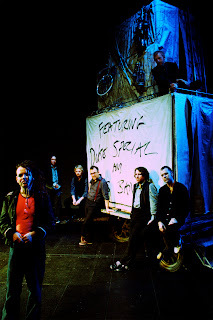 These proved a massive hit with packed audiences (often including cast and crew) treated to impromptu sets from the entire band, featuring both Duke Special songs and one-off covers that we’d cobble together during the day. A lot of these performances were captured on video and are sprawled all across YouTube if you are that way inclined. We also had the great fortune to be joined by some very special guests including Fiona Shaw, Paul Pilot, Foy Vance and the marvelous Foreign Slippers. Being a part of this production has been a real adventure. Until now I had done very little work in the theatre and I’d certainly never done a long run like this before. It’s been a fascinating experience seeing the production come together from the beginning, and being involved so deeply in the rehearsal process was a real privilege. Just watching director Deborah Warner and Fiona Shaw (Mother Courage) work was an education in itself. This was my first proper encounter with in-ear monitoring. As we were playing in various positions around the stage, all of us were using IEMs and most of our instruments were equipped with wireless systems so we were free to move about with the action. The wireless pickup on my stunt bass (ie; the one I parade around the stage with) was brilliant; I’ve worked a few little bass spins into the action over the last week as a tribute to the joy they bring! The IEMs took a lot of getting used to for me. I seemed to have the most trouble with wireless reception up in the ashtray (It reminded me of my old T-Mobile days! ), but it was fantastic for vocals with my little Madonna mic strapped to my face. So there’s still seven shows left starting tonight if you haven’t seen the show yet. I’d get booking your tickets straight away if I were you; I think it is virtually sold out. As it should be. It just remains for me to give a big thanks to Peter for involving me in this amazing project and thank everybody at the National Theatre; the staff, cast and crew for all their help over the past few months and for making this whole experience a thoroughly enjoyable and memorable one. The National really is a marvelous institution. Here’s hoping they invite us back sometime in the future! This entry was posted on Wednesday, December 2nd, 2009 at 2:31 pmand is filed under . You can follow any responses to this entry through the RSS 2.0 feed. You can leave a response, or trackback from your own site.